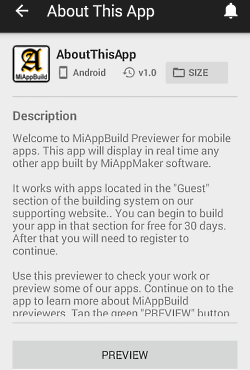 Mobile app previewers app tool to test your work before you publish. Android, iPhone, iPad and Kindle previewers for smartphone and tablet. Mobile App Previewers for Android, iPad, iPhone and Kindle. 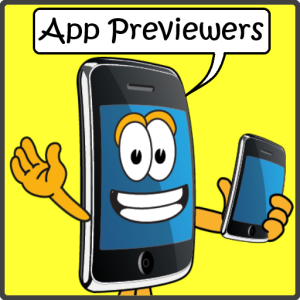 An app previewer is an essential tool for building mobile apps. 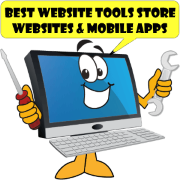 You will want to preview your app many times before publishing in the app stores. How do you test and design your mobile app before you get it published? Use a previewer. You want one that works with your device. Previewing is essential because some native functions only work on an active mobile device. For instance cell phone funtions are native. Other native functions like In-App-Purchase need to be live before they work. New this release: ui and ux upgrades. 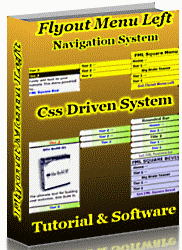 Get it free, ad free version, login required. If you are a new user you can login as "Guest" The password is "password." Once in the 'Guest' account you can preview our app(s). Not signed in yet? 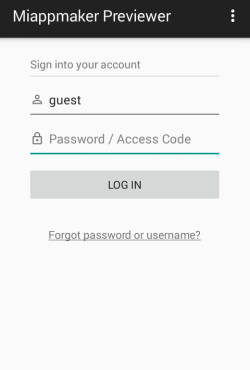 Ask to have aa version of your app copied into the 'guest account. Already have an account? Sign in with your own username and password. 1. Select A Previewer (above). 2. 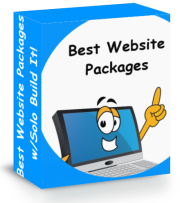 Install for free on your mobile device, keep forever. 3. 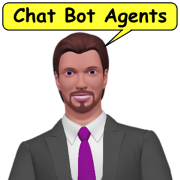 Login to your account or as a Guest. 4. Launch the app from the icon. 5. Tap the "PREVIEW" button. On your smartphone or tablet after installing you launch or open the app. The app will take about 1 minute to activate and sync itself with your mobile device. You will see a progress meter as it works. When the previewer app first opens it will ask you for a user name and password. This ensures that only you can preview your apps. And ensures your work won't be viewed by other users. Once logged in you will be presented with a list of app(s). Select the one you want and tap on the green "PREVIEW" button at the bottom of the screen. You should now see your app. It will function as if it were live in the App Stores. 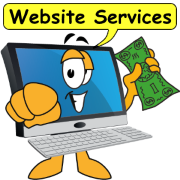 You will get all the functionality and native usability of your mobile device. If something doesn't look or work right then you can see it and fix it before you publish. 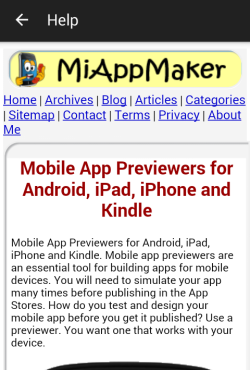 Which mobile app previewer is right for you? Most of the previewers out there are for just one platform. Which is fine, most apps are designed for one platform. iOS for example has iPhone and iPad. For android tablets and smartphones you use one previewer for both platforms. Kindle is yet another platform. That means you need a previewer for each platform. Do you want an app like this one? 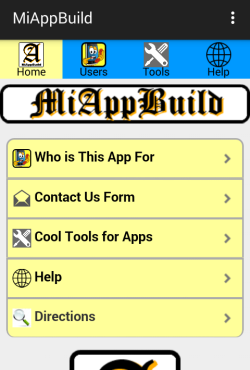 Use the Miappmaker tool to build your own. 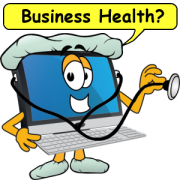 Free consultation tell us what you are looking for and get free information and recommendations. Ready to build your own app? Select an App Plan to get started. Select an app to preview then tap 'Preview' button to preview. You can see most functions. Note some functions require the app to be published before they turn on. If this happens you will see an image that simulates the function. Review the "About This App" first. 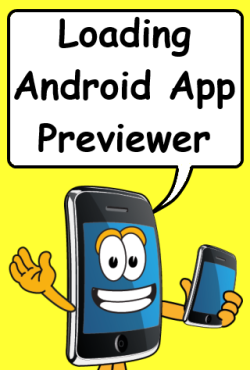 It contains help and instructions for using the "previewer" app. Additional pages include 'About' and 'Templates.' The about page is not editable so all you see is an icon. The template page shows a list of our templates. 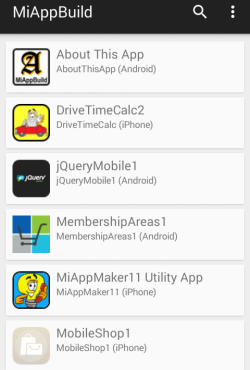 Which you can use to create an app. 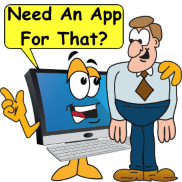 Use a Starter Application - to create an your own app. Select a starter template give it a name and select 'CREATE APP" button. This WILL add an app to the library. 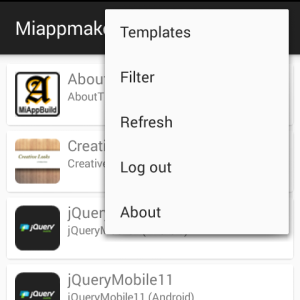 If you wish pursue it further contact miappmaker.com for setup and support. Filter - allows you to select apps to preview based on platform including any, Android, iPhone, iPad, Kindle and WebApp. Very handy for finding specific types of apps. Refresh - option re-syncs the app with the net. This is very useful for checking updates especially during the development process.